These and other words of respect and encouragement flew across The Vista School’s grassy quad last spring as fast as the soccer balls. For seven weeks, Soccer Shots, a national children’s soccer program franchise, was on Vista’s campus to hone techniques for teaching children with special needs. 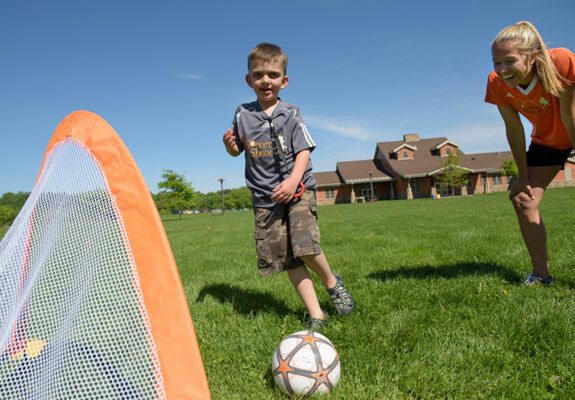 With a few of their franchise partners already running programs for children with special needs, “we wanted to make that available to all our communities across the country,” said Katy Hribar, Soccer Shots program development specialist. This summer, the company will roll out its new “Soccer Shots Empower” program for children with special needs beginning with 15 to 20 franchises. The Vista School was a natural choice when seeking a location to try out techniques for this new program. Soccer Shots and Vista have a longstanding relationship. The franchise is headquartered in Central Pennsylvania, and owners Jason and Mandy Webb have known Vista’s physical therapist, Doreen Hand, for some time. “They tried different techniques, and our kids got the benefit of PE class,” Hand said. After consulting with school staff, two classrooms were chosen for the weekly session. Rather than developing a one-size-fits-all program model, Soccer Shots staff soon realized the need to develop multiple tracks so children can progress at their own speed. Coaches found that modeling (“I do, we do”) techniques worked well as did repeating directions in a variety of ways and showing children what to do through the use of visuals. Coaches use key words and phrases to build respect and a positive attitude. “We had the best experience at the Vista School,” Hribar said. “The kids and teachers were amazing, and we loved each session with them.